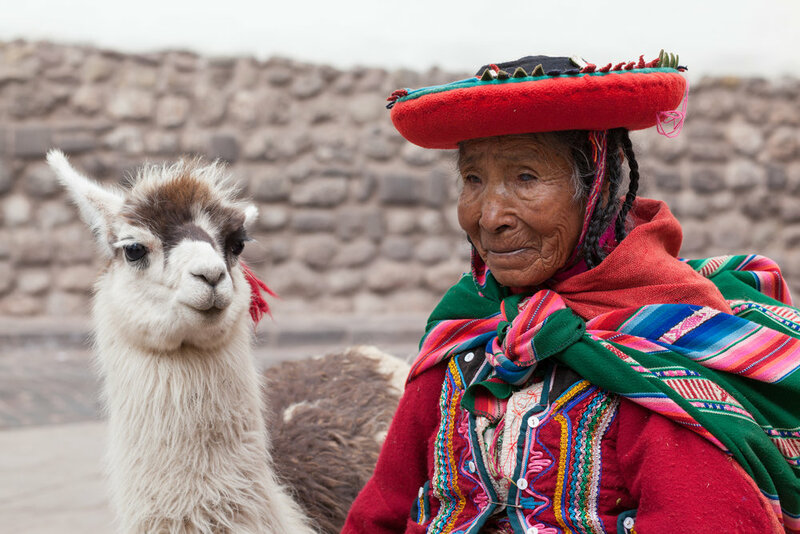 Peruvian Portrait by Geraint Rowland, Cusco. A head shot portrait taken in La Habana, Cuba. Portrait of a beautiful elderly lady in Arequipa, Peru. Classic Cuban Portrait by Geraint Rowland, Havana. Candid Portrait during Mexico's Day of the Dead. Peruvian portrait in Ollantaytambo in the Sacred Valley. Cuban Portrait by Geraint Rowland Photography. An environmental portrait taken in Mexico City of one of it's many Organ Grinders. 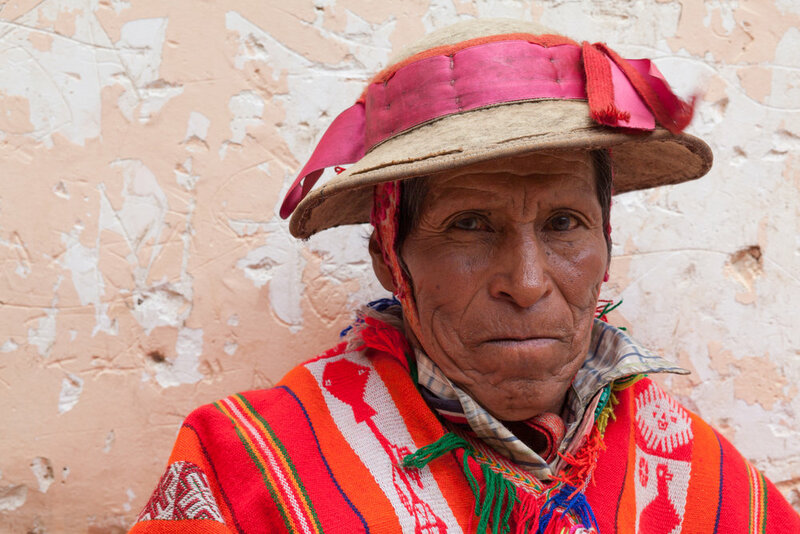 A candid portrait of a traditionally dressed Bolivian woman. With the majority of travel portraits above I asked for permission for the image to be taken. Often in touristy areas you are required or asked to pay for such portraits as was the case in Cusco, Peru, and Havana, Cuba. The image of the Mexican girl in the Day of the Dead makeup and the final image of the Bolivian lady were the exceptions as both were caught candidly. The beauty of head shots and or tightly cropped portraits is that you minimise the clutter in the background of the image. All of the portraits were taken using a Canon 5D (Mark 2 or 4) and the majority were with the Canon 50mm 1.4. Other lenses used were the Canon 85mm 1.8 and the Sigma Art Lens 135mm 1.8. All of the images were taken using natural light and without the use of a flash. The images were often taken with a shallow depth of field to create a pleasing background and draw attention to the persons face. Images of people from around the world fascinate me, I think that they tell you more about a place than a landscape ever can. In the future I want to focus more on portraits and improve my skills in this area of photography. More of my travel photography can be found on my website, Instagram, Facebook Page and my Flickr account. If you would like any more information about any of my images please send an email to: geraintrowlandphotography@gmail.com. Children lead a sheep to the ocean for a wash in preparation of the Tabaski festival. The Tabaski festival is known globally as the Eid al-Adha and is celebrated among Muslims worldwide. Horse and Carts are used in Senegal to transport people and produce up and down the hard packed sand beach of Yoff. Excited African children play in the ocean as their father brings his boat back onto shore. 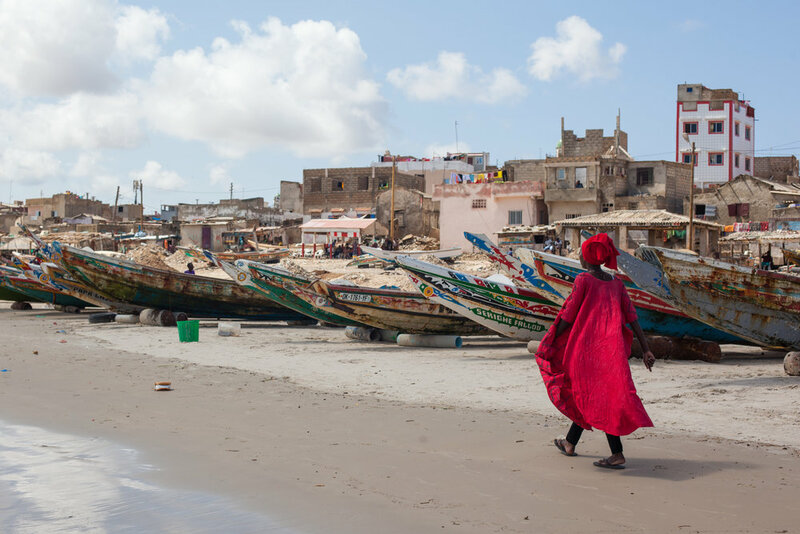 A Sengalese woman in striking African clothing walks past the fishing boats which line the beach. Senegalese Children play football on the beach in front of the large Mosque which overlooks the beach at Yoff in Dakar. Children wearing football T-Shirts sit amongst the fishing boats at the far end of the beach at Yoff in Dakar. A fisherman feeds his pet pelicans some fish at sunset in Dakar, Senegal, West Africa.. The beach at Yoff is used as a means of transportation with Horse & Cart transporting people and produce along the beach. In the afternoons the beach becomes a huge gym with hundreds of Sengalese coming to exercise in groups or alone. Several football games take place along the stretch of sand and men practice the Sengalese form of wrestling by the shore. Yoff is also a place to pray with one of the biggest Mosques in Dakar situated overlooking the beach. More of my travel photography from Senegal can be found on my website, my Instagram, and my Flickr account. If you are interested in purchasing any prints, using an image online or would like further information please send me an email at: geraintrowlandphotography@gmail.com.